April 15, 1912 was a morning the world awoke to the seemingly impossible news that the new White Star liner, the latest word in ship-building technology, was on the bottom of the North Atlantic. At Maplecroft, in the comfort of her breakfast nook off the kitchen, or perhaps in her blue, floral-papered dining room, Lizzie Borden must surely have read the news in her Providence Journal or Fall River Herald and was as shocked and disbelieving as the rest of the world. The sinking would be the talk in every city, town and village for many months to come. 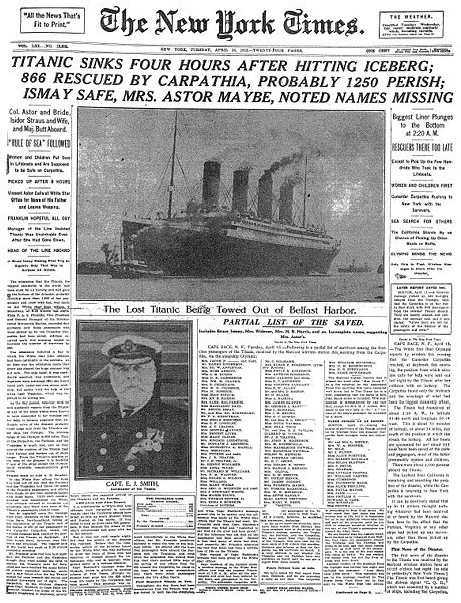 With the great city of Boston so close to Fall River, some passengers aboard the ill-fated liner were Boston-bound after the ship was to have docked in New York city and some Fall Riverites knew or had connections to some of the lost and survivors. Some passengers called Massachusetts home, some were coming to Massachusetts from the old country for a better life. Her son, Newell Robb, was curator of the Fall River Marine Museum for a time, and the family made their home in nearby Westport. Mrs. Marjorie Robb had lived near the water at Westport Point until she was unable to live alone. She was a frequent speaker at area schools, churches and civic groups. She attended several conventions of Titanic societies and held audiences spellbound with her clear recollections of the disaster.